Walk to Park City Mountain from this ground floor condo that offers beautiful views! Walk to Park City Mountain from this ground floor condo that offers beautiful views! On the free shuttle route for easy access to Park City Mountain, Deer Valley Resort and Main Street and all of the area's attractions. This convenient condo sleeps up to 4 guests. The queen bedroom offers a comfortable 2" memory foam mattress topper and 32" flat screen TV. Two guests may sleep on the comfortable sofa-sleeper in the living room, upgraded with a 7" mattress. Relax while enjoying the 60" flat screen TV and the cozy wood burning fireplace. There's a full kitchen for easy meal prep and a dining counter with seating for 4. Free wireless internet, common area hot tub and heated pool available in winter/summer seasons. Moderate rating. Great Condo for Park City Skiing! Great little condo. The two of us and our luggage and ski gear fit great. Loved the hot tub and heated pool after skiing. The full kitchen allowed us to make breakfasts and dinners in to save on expenses while still eating lunches on mountain and village/town apres' drinks+apps at end of day. Loved the fireplace. Everything was great and hope we can get the same place next year! ps the cleaning crew did a fantastic job and got us in a couple of hours early which was super appreciated since we had just flown in from Florida. Also, the office staff were great about us dropping of our luggage at checkout and leaving it while we skied the last day. Changed at the office into travel clothes and red-eye'd it back home. In general this is a nice and comfortable place. Good parking and close to the mountain. It's easy to walk to if you want. Only real downside was the heat. It was very cold when we arrived, so we bumped up the heat a little. It eventually became uncomfortably hot, and we were never really able to regulate it very well. Otherwise, everything was nice. I'd definitely recommend this place. Good overall stay. Friendly staff. Great location on first floor near base and town with amazing bus service right there. Unit was nice and clean. Bed super comfy. Sofa bed not super comfy. Kitchen clean and stocked with the necessities. Hot tub great. Biggest issue was not much control over heat. Either on or off so either roasting or chilly. Not a huge deal for me because I like it cool. Overall very satisfied. Great ski vacation! Thank you! Thanks so much for your review and letting us know about the heat. Glad you you had a wonderful time in Park City! We enjoyed being able to walk to the lifts at Park City base area and shuttle route to go to historic downtown Park City for dining and shopping. Condo is also walking distance to a few convenience/grocery stores/restaurants. The large living area and fully-stocked kitchen allowed us to relax in the condo between adventures. We watched a lot of March Madness on the giant flat screen TV, but we were curious why they don't have HD on such a nice TV. The bed was extremely comfortable! It was nice that firewood was provided so that we could use the real fireplace! The outdoor pool (heated in winter) and hot tub were just steps from the door to this unit. 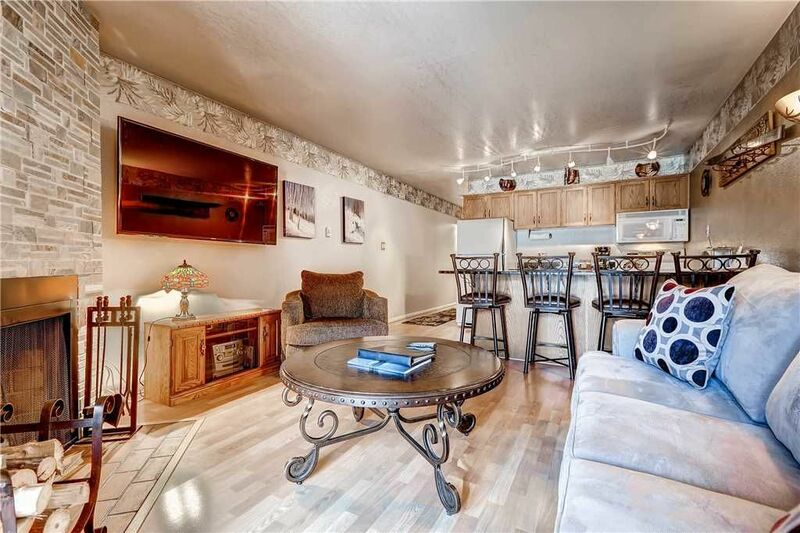 I would definitely recommend this condo to another couple looking for a fun ski adventure. Handled by property managers, check in was easy. We liked the keypad entry to the unit so that we didn't have to share or carry around keys.